This is a ratcheting crimping tool for Anderson Powerpole Contacts - 15 A (1332), 30 A (1331), and the 45 A (261G2). 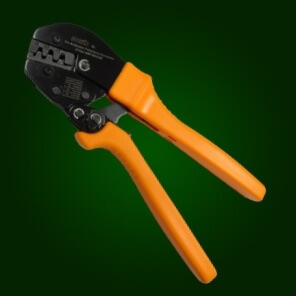 This is a ratcheting crimping tool for Anderson Powerpole Contacts - 15 A (1332), 30 A (1331), and the 45 A (261G2). This tool is manufactured by IWISS. 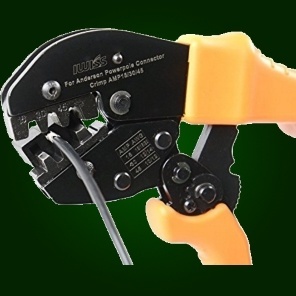 This crimper has a built in contact positioner that holds the contact during crimping. There are 3 jaw positions, one for each contact rating. Crimping Instructions for 15 A & 30 A contacts: Insert the wire into the contact prior to crimping; Insert the contact into the 15 A or 30 A position on the crimper with the flat side of the contact facing down; Now squeeze the handle until the ratcheting stops, releasing the handle back open. Crimping Instructions for 45 A contacts: Insert the contact into the 45 A position on the crimper with the flat side facing down and the open side facing up; Insert the wire into the contact maintaining the correct contact position inside the crimper; Squeeze the handle until the ratcheting stops, releasing the handle back to open.